. 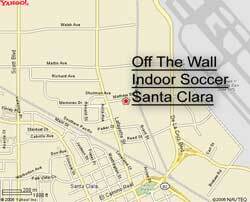 Santa Clara Soccer Camps. Take 101 north, exit on De La Cruz Blvd., turn right on Central Exprswy, turn left on Lafayette, at the third light (after Home Depot) turn left on Mathew. Take 101 south, exit on San Tomas Exprswy (south), take Central Exprswy east, turn right on Lafayette, at the third light (after Home Depot) turn left on Mathew. Take 280 south, take 880 north, exit on Alameda (left), follow stay right on El Camino, go past Santa Clara University, turn right on Lafayette, and turn right on Mathew. Take 880 south to The Alameda, exit to the right, follow onto El Camino, go past Santa Clara University, turn right on Lafayette, and turn right on Mathew. Take 880 north to South Bascom, exit to the North, follow onto Washington, then Lafayette, past Santa Clara University, continue past El Camino Real, turn right on Mathew Street.